LAKE SUCCESS, N.Y., April 7, 2011 – Canon U.S.A., Inc., a leader in digital imaging, today announced significant enhancements to the Canon XF305 and XF300 Professional Camcorders, including the ability to configure two units for 3D HD video capture. Canon's new firmware upgrades the XF300-series camcorders to include Canon's 3D Assist Function that allows two units to be easily set up for 3D HD video, as well as an updated Scan Reverse function, Double Slot Recording for instantaneous backup, and the option to disable Relay Recording. 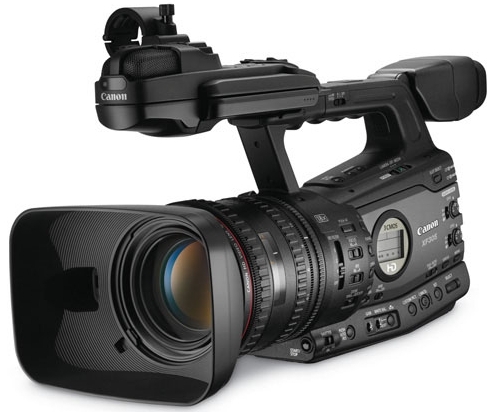 Canon will be demonstrating a range of professional applications for the Canon XF305 and XF300, including 3D image recording, at the Company's booth # C4325, at the 2011 National Association of Broadcasters (NAB) Show in the Las Vegas Convention Center, April 11th-14th. "Our professional imaging equipment continues to offer cutting-edge features and capabilities that professionals need in the field and helps open new doorways to endless possibilities for creative expression, " said Yuichi Ishizuka, executive vice president and general manager, Imaging Technology and Communications Group, Canon U.S.A.
Canon's 3D Assist Function facilitates the setup of two XF305 or XF300 Professional Camcorders when used together to capture 3D HD video. The new firmware includes the ability to perform OIS Lens Shift to aid in optically aligning two XF305 or XF300 camcorders and a Focal Length Guide to display the zoom position of each camera in relation to each other and help calibrate zoom settings. This adjustment can be done through the menu system while the camcorders are mounted to a rig or tripod. Once aligned, the amount of the angle-of-view change is displayed after zoom adjustment, preventing camera misalignment and simplifying adjustment. This is similar to the 3D shooting functionality found in the Company's XF105 and XF100 model professional camcorders. The new firmware updates the Scan Reverse functionality of XF300-series camcorders to allow for recorded images to be flipped on the horizontal axis, vertical axis, or both simultaneously to facilitate recording with 3D mirror rigs. This new function allows the camcorders to record footage simultaneously to both card slots for instant backup of important footage and files. Ideal for use in production environments to ensure multiple copies are secured for each take. Relay Recording, an innovative feature where footage is seamlessly recorded to the second CF card as the first fills up, can now be turned off to prevent capture data from automatically being recorded to the second card. This allows the second card to be protected from recording and used only when designated or to allow the user to only copy or back up select takes to the card. The Company's XF300-series camcorders employ Canon's XF Codec, an MPEG-2 4:2:2 50Mbps codec for native 1920 x 1080 HD video recording onto affordable, universally available Compact Flash (CF) cards. Uniting video, audio and metadata into a single file, the Canon XF305 and XF300 use an MXF (Material eXchange Format) File Wrapper, a widely supported open-source format, to maximize compatibility with existing industry infrastructure and non-linear editing (NLE) systems. The Canon XF305 and XF300 Professional Camcorders include a Genuine Canon 18x HD L-series lens, three Canon developed and designed native 1920 x 1080 CMOS image sensors, and Canon's own XF Codec that delivers the extreme color detail required for accurate chroma-keying, color-grading and compositing for digital filmmaking. In addition, Canon's XF305 model features industry-standard HD-SDI output, genlock, and SMPTE time code (in/out) terminals for multi-camera, broadcasting or 3D production. Priced under $8,000 and $6,700 per model respectively, the Canon XF305 and XF300 Professional Camcorders are designed for multiple production applications including broadcast news, documentary and independent filmmaking and event videography.